Malice Mizer was a visual kei band active from 1992-2001, whose name has virtually become a byword for extravagant theatrics combined with classically-inspired music. Over their 9-year history they approached the question of "ningen to wa?" ("what is human?") from a variety of angles as they changed their member lineup and visual presentation. 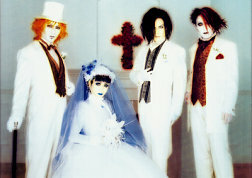 Malice Mizer formed in 1992 as the brainchild of guitarists Mana and Kozi. They had previously played together in the band Matenrou, which contained some of the darker gothic spirit combined with a harder straight rock sound. When Matenrou disbanded in April of 1992, Mana and Kozi decided to create a new band using double guitars to bring forth a sound closer to classical music and Italian horror soundtracks. With the addition of vocalist Tetsu (ex-NERVOUS), bassist Yu~ki (ex-ZE:RO), and drummer Gaz (ex-DATURA), Malice Mizer's first lineup was completed. Gaz would soon quit and be replaced by Kami (ex-Kneuklid Romance), who would remain with the band until his untimely death in 1999. The new band got off to somewhat of a slow start, but over the next two years they played several tours, released four demos, and finally cut their first album "memoire". However, on 12/27/1994, Tetsu parted ways with Malice Mizer to pursue his own musical vision, and the band went on a hiatus for the next several months. Despite Tetsu's departure, the remaining members wanted to continue the project, and so they began the search for a new vocalist. At last, they found the right man for the job, "Camui Gackt" (ex-CAINS:FEEL). Malice Mizer made its return with Gackt as the frontman in the fall of 1995. With the addition of this princely vocalist, the band took a turn toward theatrical, fanciful costuming and sweeter, romantic themes - as well as the dark vampiric side that had always been part of Malice Mizer. During this period they released the singles "uruwashiki kamen no shoutaijou" and "ma cherie", as well as the album "Voyage sans retour". Malice Mizer's growing fame eventually attracted the attention of major label Nippon Columbia, who signed them in the spring of 1997. During their Columbia years, Malice Mizer reached their peak of fame; they released 5 singles and the album "merveilles", and made regular television, magazine, and radio appearances. They played live shows to sold-out arenas featuring their most elaborate staging and costumes to date. However, misfortunes were soon to befall the band. In early 1999, Gackt decided to leave Malice Mizer, for reasons known only to him and the other members; soon thereafter he would start his own solo career. Moreover, in June 1999, drummer Kami unexpectedly passed away due to a subarachnoid hemorrhage. 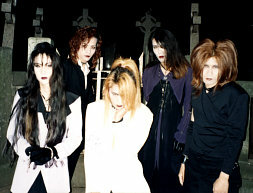 Malice Mizer left Columbia and returned to their indies label Midi:Nette, where they continued activity without a vocalist or drummer. They released the singles "saikai no chi to bara" and "kyomu no naka de no yuugi", and a memorial tribute to Kami, "shinwa", over the subsequent months. The band then set themselves to creating new music that would bring forth the gothic elements of their concept to the fullest. However, in order for the new Malice Mizer to be reborn, a vocalist was required. This time, they called on an old acquaintance of Yu~ki's, Masaki Haruna, formerly of Pride of mind. Taking the name "Klaha", the mysterious "Fourth Blood Relative" performed session vocals for Malice Mizer's next single "shiroi hada ni kuruu ai to kanashimi no rondo" and their album "bara no seidou". During Malice Mizer's 2-day live at the Nippon Budokan on 8/31-9/1/2000, Klaha was officially inducted into the band as a full member. From here on, Klaha took the role of the "gothic aristocrat" - blending the darkness of Malice Mizer's world with his own brand of sentimentality. During his tenure, Malice Mizer released the three singles "Gardenia", "Beast of Blood", and "Garnet" in 2001, and filmed the silent Dracula movie "bara no konrei". 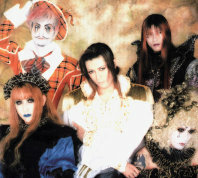 The long history of Malice Mizer came to an end in December 2001, when it was announced that they would be taking an "indefinite hiatus". The members went their separate ways, and most pursued solo careers of their own, with varying degrees of success. While the story of Malice Mizer ends here, it was also the beginning point for several new artistic lineages.